It doesn’t matter which ship you sail on – or whether you are cruising the Caribbean or the Arctic. The one thing you will need to decide before you sail is the type and grade of accommodation you’re going to stay in during your cruise. Deciding which cabin (or stateroom as they are also known) to pick, especially on some of the bigger ships, can be quite a daunting task. For a start, there’s so much choice: some ships can have upwards of 15 different categories of cabin. If you’ve never cruised before that can be quite an overwhelming selection to choose from. To try and make things a little easier for you therefore, I’m going to highlight some of the most popular options – options that you are likely to find on almost every cruise ship. The inside cabin is the smallest onboard option. As the name suggests, it is inside the ship and does not offer a window or balcony. Although it’s small, that doesn’t mean you compromise on features; most inside cabins are more than adequate for a couple going on a two-week Mediterranean cruise – or a small family that just wants a last-minute bargain. An outside cabin offers either a large picture window or a porthole (it will be clearly stated which on the website of your chosen cruise line and ship). Outside cabins are usually larger than inside cabins, but do double-check the size guides before you book. Some outside accommodations are listed as having obstructed views; this simply means that there could be a lifeboat blocking some of the window. Although most people would prefer to see clearly to the outside world, these options are sometimes a little cheaper if you would like some natural light but don’t want to pay the higher costs for unobstructed views. As the name suggests, a balcony cabin comes with a small section of outdoor space. Balcony cabins are usually bigger than the outside option, and if you’d prefer to spend your evenings sitting on your own private deck and watching the sunset then you can do so. Balcony options are also a great choice for those who like to have some natural air circulation instead of relying on air conditioning during the cruise. 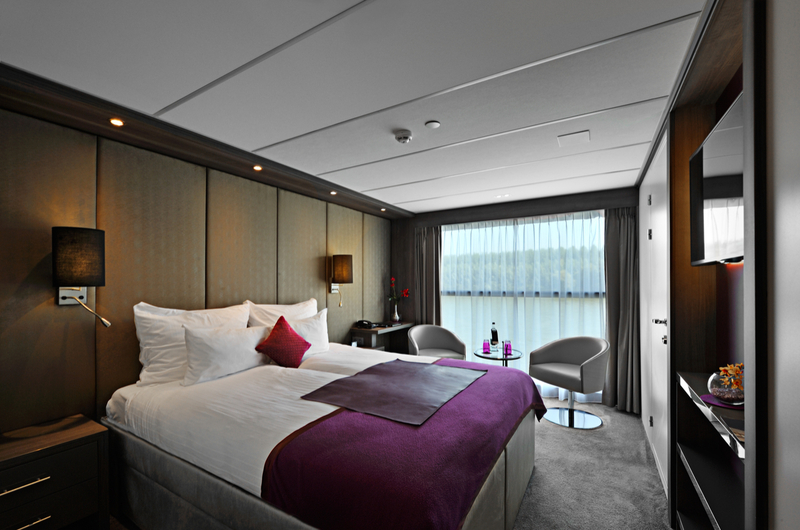 Onboard suites are spacious and often come with a wide variety of extra perks. Some even come with their own personal butler! You will often have separate living and sleeping areas, a balcony and a larger bathroom (sometimes even two). If your budget allows, then this really is the most spacious and most luxurious choice. Of course, exact options and grades vary per ship – some ships even offer studio-type apartments or options that span two floors – but this list covers the basic choices, and is a good place to start. Known to her blog readers as CruiseMiss, Danielle is a freelance writer and social media professional covering all aspects of sea travel. In a 2014 poll conducted by USA Today she was one of only two British bloggers to figure in the Top 10.